After last weeks stupidly short article I thought I’d make an extra effort to write a decent length one this week although I wasn’t sure if that just made me look like a fair weather writer after a good week? Nonetheless here it is. So a good week after last weeks disaster. If I use a few rules of thumb. 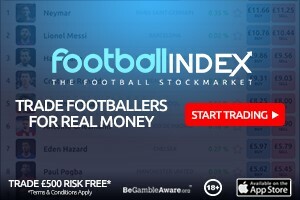 A good week is a gameweek rank with a green arrow and a gameweek rank insde 1m. 7 returning players out of 11 is also good with an average around 4. 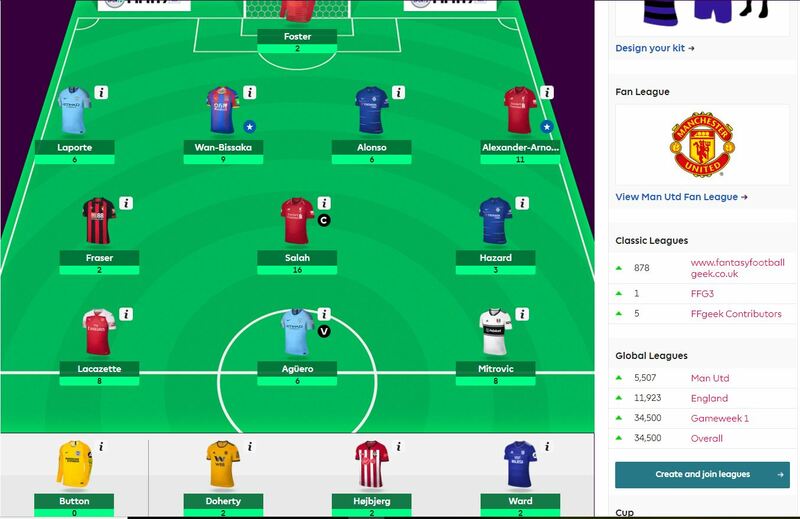 A gameweek rank inside 100,000 is reason to be pretty happy. In the context of a wildcard it’s a little different. Alex Ball interestingly uses the before and after test which is what would you have got if you hadn’t wildcarded. If I assume that my transfer would have been Austin for Mitrovic which it definitely would have been then I gained only 9 points. Was the wildcard a panic decision and the wrong decision? Points wise immediately after it didn’t seem the game changing decision it should be. I’m also not sure whether activating it on a Friday night shows panic or shows careful consideration. I certainly was far more relaxed over the weekend than I would have been if I hadn’t wildcarded that’s for sure. That’s because my team, as it was, had failed to neutralise many popular players and the score was going to be very dependent on a Chelsea clean sheet and Liverpool success. The wildcard if it did nothing else spread team risk taking it away from being disproportionally reliant on those 2 factors. I though Salah was again unlucky even if his goal was lucky and I can’t help feeling there’s a big score around the corner. Hazard I thought was very disappointing. I don’t like players from an FPL point of view who continually drop back and pick the ball up and then turn into a mass of defenders which is what he seemed to be doing all day. I effectively chose Lacazette over David Silva as I was spooked about Silva playing 90 minutes v Lyon. That did work out although again I thought Lacazette was really poor apart from the goal. With Brighton at home for Silva next that may still have some comeback. All 4 defensive players got a clean sheet. Wan Bissaka has been an amazing contributor. For me Palace are a decent £4.5m defensive option when Tomkins is in the team and he lead the defence in interceptions and clearances. He did make 1 mistake though which nearly gave a goal away. Wolves also showed what a solid defensive outfit they are and although I dislike going double defence I wonder if I should have gone for it with Patricio as my GK as well as Doherty. Laporte played which was another bit of luck and Mitrovic just keeps posting brilliant numbers. 1.13 xG and 8 shots is incredible stuff. 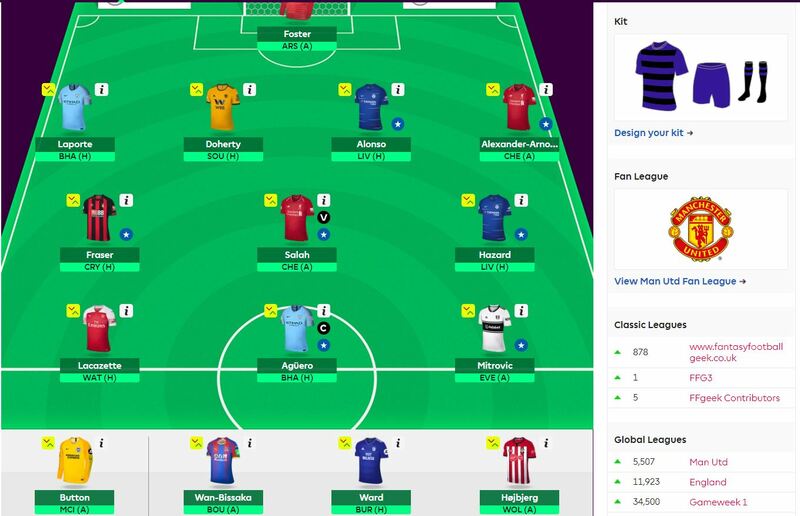 I think as a rule of thumb that you shouldn’t need to do a transfer after a wildcard unless you’ve got injuries so hopefully I’ll carry over a free. There’s no one screaming out to be transferred in although the performance of Gundogan was a bit of an eye opener and the price mitigates the price somewhat. Maddison also posted good numbers for the 3rd week in a row even if he was moved to the left rather than a CAM. Richarlison also looked dangerous as well although he still has some convincing to do that he can finish off the chances he creates for himself. If you just focus on the fixtures then Aguero seems the natural captain option without a doubt. The EFL Cup midweek should see him rested and hopefully not even on the bench. The UCL match the week after is away to Hoffenheim which they definitely have to win and then it’s away to Liverpool. Will he play all 3? I can’t see him not playing the last 2 so again it will be another “will he won’t he Friday” of speculation and fake news probably. With Chelsea playing Liverpool that makes either Hazard or Salah a tricky pick. Lacazette v Watford? Seems a pretty out there pick to me. The Palace defence is looking good enough to even risk them away to Bournemouth although I can’t help feeling they should be on the bench which is where I’ve put them for now. That’s my only decision to make at the moment. That’s it hope you had a good gameweek. Great article. You are forgiven for your short article last week in the face of a frustrating week. Just remember your audience needs you more than ever after s bad week…. It’s my favourite article of the week, linking the weekend just gone with thoughts about transfers and plans for the week ahead. It’s the one I look forward to and enjoy most..
sooo want to play him this week but have Hennessy as my #1 means doubling up on palace, and my formation plans are a bit too radical, help needed…. *Alonso in the back 3 too. Not worth having Zaha on the bench. Sell him if you don’t play him. Mane is a “nothing pick”. Risk Alli/Son/Eriksen I reckon. Tempted to get Kane for Hudd/CAR. Guys i could really do with some advice. My team is in a bit of a dilemma. I have hennessy , alonso , robertson, mendy, bissaka, bennett….hazard, erikksen, richarlson, fraser, neves, …lacazette , aguero and wilson. Both liverpool are playing chelaea and bmouth vs palace . So like 6 are stuck playing each other. I considered free hit but then i find out you cant carry ft. I am currently on 402 points. But really struggling to make a decent move. Welcome any thoughts. Obv city playing liverpool doesnt help much either. Lose Mendy before his price sinks any further. He makes too much of a dent to be a non-player right now I think. Other than that, why not swoop for Mitrovic now? Bar Arsenal, there are some tasty fixtures coming up. 402 is a cracking score at this stage. It’s a marathon, not a sprint. (I’m on 400 and it’s the best start to a season I’ve ever had so I’m dead chuffed!). Good luck with yours and hopefully you can give me some ideas in exchange at some point in the future!